• Brunswick Square, Bloomsbury. In Emma, the main protagonist’s married sister, Isabella, lives here with her lawyer husband John Knightley and children. Isabella is well pleased with her home, noting “We are so very airy”. • Hill Street, Mayfair. Admiral Crawford, uncle of Henry and Mary Crawford, lives in this street in Mansfield Park. 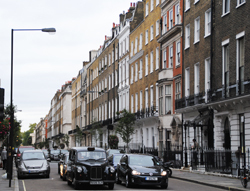 • Harley Street, Marylebone (pictured). John and Fanny Dashwood took a house in this street for the “season” in Sense and Sensibility. • Bond Street. 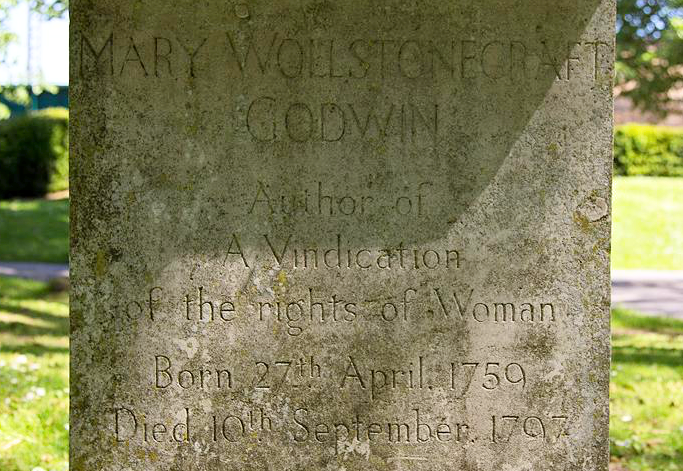 Well known to Austen, she has Marianne, then upset over Willoughby (who has lodgings here), visit here on a shopping trip in Sense and Sensibility. It’s said to be the “only reasonably certain portrait from life” – a sketch by Jane’s older sister Cassandra which purportedly depicts the artist. 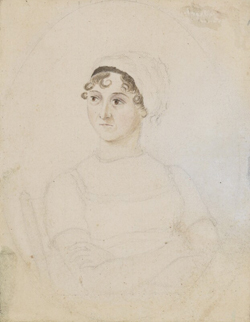 Found on display in Room 18 of the National Portrait Gallery, the pencil and watercolour sketch dates from about 1810 and was purchased by the gallery in 1948 for £135. The image was the basis for a late 19th century water-colour image of Jane which was created by Maidenhead artist James Andrews who traced Cassandra’s sketch. 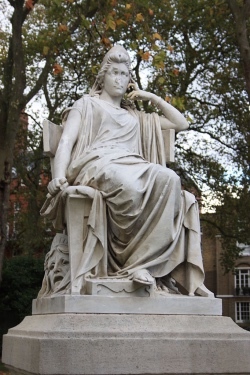 Andrew’s image had been commissioned by Jane’s nephew, James Edward Austen-Leigh, and he used an engraving of it – made by William Home Lizars – as a frontispiece to his biography, A Memoir of Jane Austen. It is an image of that engraving which features on the new £10 polymer banknote going into circulation tomorrow. 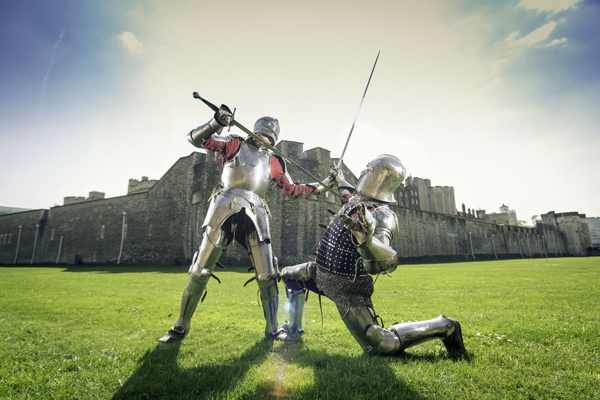 The decision to use the later image rather than the original has attracted some criticism – not for the subject but for the fact that, as historian Lucy Worsley told The Sunday Times, it represents “an author publicity portrait after she died in which she’s been given the Georgian equivalent of an airbrushing”. There has, we should also note, been some criticism of the choice of quote on the note – “I declare after all there is no enjoyment like reading” comes from Pride and Prejudice and was uttered by the deceitful Caroline Bingley who really has no interest in reading at all! 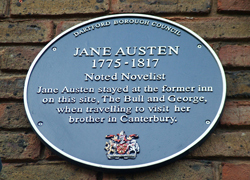 Jane Austen was known as a patron of London’s theatre – in some cases attending shows several times a week while in the city (despite the fact that many, based on her writings – in particular Mansfield Park, believe she wasn’t really a fan). • The Lyceum Theatre: Jane visited this Wellington Street theatre more than once and expressed her frustration on one occasion of her failure to see the incomparable Sarah Siddons perform there. • The Covent Garden Theatre: The theatre Jane attended was a second iteration, opening in 1809 on the site of what is now the Royal Opera House adjacent to the market as a replacement for the previous theatre which, dating back to 1732, had burned down. 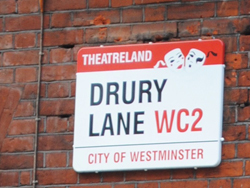 • The Theatre Royal Drury Lane: The oldest of London’s theatres still in use, Jane saw the great actor Edmund Kean famously perform here as Shylock in the Shakespearian play, The Merchant of Venice, in 1814. As you may have realised (the new £10 banknote anyone? 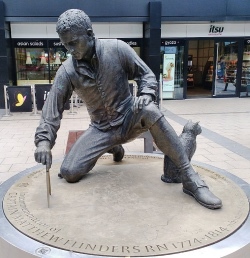 ), this month marks 200 years since the death of Jane Austen in Winchester on 18th July, 1817, so to mark the occasion, we’re looking at 10 sites of interest from Jane Austen’s London. To kick off our new Wednesday series, we’re looking at one of the locations where she is known to have resided while in London – number 10 Henrietta Street. 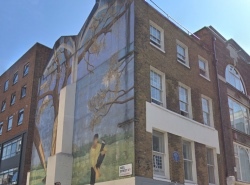 Number 10 in those days was the location of a bank – Austen, Maunde and Tilson – in which Jane’s older (and favourite) brother Henry was a partner. Above the bank’s offices was a flat Henry moved into after the death of his wife Eliza in 1813. 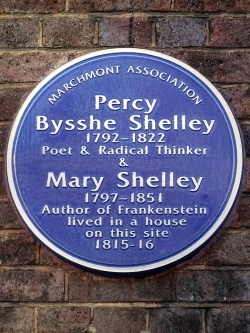 It was also where Jane stayed when visiting publishers in the summer of 1813 and again in March, 1814, the latter when she was working on the proofs of Mansfield Park. As well as a dining room at the front on the first floor, it had a sitting parlour, small drawing room and bedchambers (Jane is known to have stayed in one on the second floor). She described the property as “all dirt & confusion, but in a very promising way”. 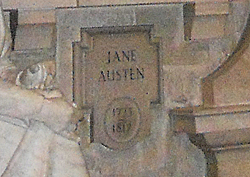 Austen is known to have visited nearby theatres including the Lyceum and the Theatre Royal in Drury Lane while staying in London and during 1813 also visited the “blockbuster” exhibition of Sir Joshua Reynold’s paintings at the British Institute in Pall Mall ( a fascinating reconstruction of which can be found here). 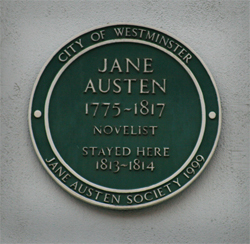 A City of Westminster Green Plaque (erected in partnership with the Jane Austen Society) commemorates Jane’s stay here. 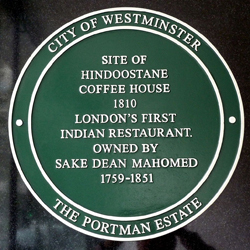 Described as the first dedicated Indian restaurant in Britain, the Hindoostanee (also spelt Hindoostane) Coffee House was established by Dean Mahomet (later Sheikh or ‘Sake’ Dean Mahomet), an Indian who served with the East India Company Army before coming to Britain. 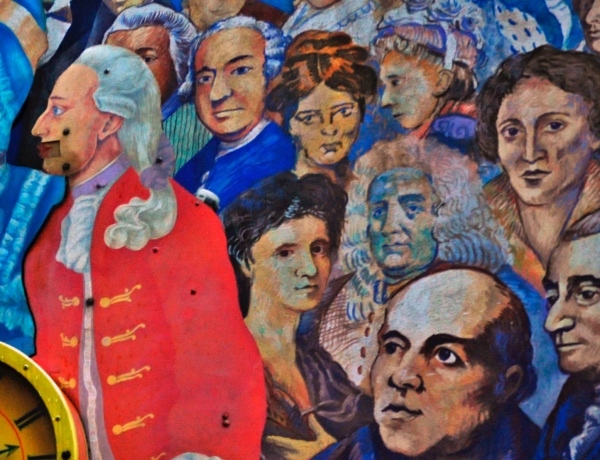 Accompanying East India Company man Godfrey Baker to Ireland, he lived initially with the Baker family before meeting and marrying a young woman while learning English and subsequently establishing his own household in Cork. In 1794, he published a book, The Travels of Dean Mahomet, which, written as a series of letters to an imaginary friend, described his own life and Indian customs. It is credited as the first book to be written and published in English by an Indian. 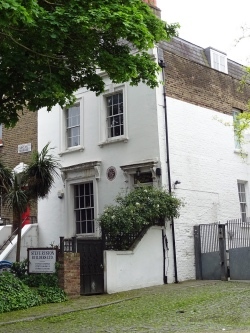 Around 1807, he and his wife and son moved to London where he initially found employment with Sir Basil Cochrane at a “vapour spa” Sir Basil had established in Portman Square. While Mahomet introduced Indian innovations such as “shampooing” to the spa, he was given little credit for his work, however, and so decided to break out on his own. 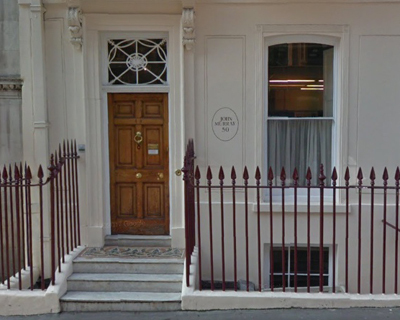 In 1810, he set-up the coffee house at 34 George Street, Portman Square, just behind Sir Basil’s house. The establishment was aimed at Anglo-Indians who had spent time in India and offered them Indian-style foods – such as curries and spiced dishes – along with other reminders of the sub-Continent such as a room set up for the use of the hookah with “real Chilm tobacco” – all in an Indian-style setting. Sadly, the establishment was only rather short-lived and, despite taking on a partner, Mahomet was forced to declare bankruptcy in 1812. But he did go on to establish a very successful Indian-style baths in Brighton, Mahomet’s Baths (and later even opened a second branch in St James’s London which would be managed by his son). 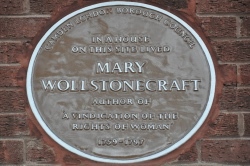 A plaque was erected by the City of Westminster close to the site of the former coffee house in 2005. PICTURE: Simon Harriyott from Uckfield, England [CC BY 2.0 (http://creativecommons.org/licenses/by/2.0)%5D, via Wikimedia Commons.